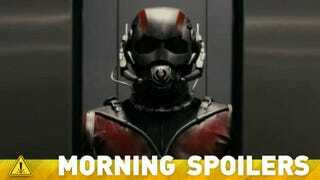 What Shocking Event Forces Ant-Man To Join The Avengers? Check out what appears to be our first glimpse of Chewbacca's look in The Force Awakens. Yet another character is supposedly in the running to appear in Suicide Squad. Bruce Campbell spills the details on the Evil Dead TV series. And did Clark Gregg just hint at an Avenger cameo in Agents of SHIELD? Spoilers now! Take all of this with the requisite salt, but someone who claims to be "close to the production" e-mailed Starlog with information about how Ant-Man will tie into the rest of the Marvel universe. It repeats the older rumor that Hank Pym will be seen working with Howard Stark, Arnim Zola, and Alexnder Pierce. In addition, Pym will meet a young version of Thaddeus "Thunderbolt" Ross, who will show up again in the after-credits sequence to recruit Pym to joinTony Stark's side in the conflict. Ross reportedly answers a question about why he's there with "Haven't you seen the news? We're at war." I don't remember seeing an artificial intelligence movie where the robot is bonkers — the most emotionally unstable person in the film — and who has this knowledge of 3,000 years of recorded history and who is a pouty teen, all at the same time. The director of the movie joined us; he asked whether any of us had watched Speed. He said that that blend of action with a time sensitive conflict was what inspired the plot of Suicide Squad. The director asked what we enjoyed more in an action movie, a serious action movie like The Raid or a more comedic approach like in the Jump Street movies. Near the end, we were broken into groups of three (there were 9 of us total) and given a one page summary of the plot, we were asked to describe what we liked and didn't like. What we were given mentioned Harley Quinn being needed to decipher a complex series of bombs planted throughout Gotham. Harley is estranged from The Joker, and her knowledge is being used to figure out where The Joker has placed the bombs. Deathstroke is Amanda Waller's personal bodyguard, and he's placed in the squad to oversee that they do not deviate from the mission perimeters. The plot then becomes more complex as The Joker has a far more complex goal in mind. I'm paraphrasing what the other plots were, but they all deviated slightly. Some had Harley as being a part of the squad, but betraying them for The Joker. The other involved a conspiracy from Lex Luthor which involves working with The Joker. My final impressions are positive. Before we left the director showed us concept art. Some were ok. The boomerang guy and the witch girl were not that great. I really liked Deathstrokes design, they really gave him this realistic but tech-geared look that is probably the best design I've ever seen of Deathstroke. Ash has survivor's guilt… He's a war vet. He doesn't want to talk about and he'll like about that stump on his hand to impress the ladies. That's what I look forward to playing—a guy with horrible flaws. [It's] a place where you can be whoever you want to be and there are no consequences — no rules, no limitations. ... What happens in Westworld stays in Westworld. ... We intend to make the most ambitious, subversive, fucked up television series.